I planned my home birth meticulously, right down to what snacks I would have on offer for our visiting midwives. 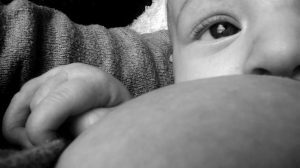 An area that I did neglect when putting together my birth plan, however, was breastfeeding. Call me naive or maybe overly optimistic, but with my rose tinted glasses on I half expected our first breastfeed to be like a scene out of Snow White. his first ever feed was not from me! When my baby boy arrived in August 2015 at 38 weeks I was presented with the opposite, my beautiful baby just didn’t know what to do and I had very little knowledge to help guide him. The Midwives did their best to help me but nobody could get my baby to latch, and due to some minor concerns surrounding his blood sugars his first ever feed was not from me! Our breastfeeding journey definitely had a rough start but I am pleased to say almost 2 years on we are still going strong! If I were to plan my home birth again, I would definitely dedicate an area on my birth plan to breastfeeding. I would also attend the one off breastfeeding session held at our local hospital (I attended this over a year later as a volunteer and found it so informative!). Another thing I would do is gather information on who can help if required. Looking at our local breastfeeding support there are 3 main types; NHS, Voluntary and Private. One of the benefits of having a home birth is that you get to stay in the comfort of your own home, a slight negative of this though is not being able to press a buzzer when you need some help. Knowing the basics of how to latch your baby is valuable, as is knowing the signs that breastfeeding is going well. I can not emphasise enough what a helpful guide this is: http://kellymom.com/hot-topics/newborn-nursing/, all mums to be should read it!! Lastly, did you know that home birthing mums in Hull (HU1 – HU9) are able to access Goodwin Breastfeeding Support home visits? For further details please contact: Caroline Wiggins, Breastfeeding Peer Support Coordinator at Fenchurch Street Children’s Centre on (01482) 497800. Or email Caroline: cwiggins@goodwintrust.org.